Would Americans Support a Reduction of the U.S.’s Contribution to the U.N. Regular Budget? The U.N. General Assembly’s General Debate starts on September 25, 2018. This year’s theme is “Making the United Nations Relevant to All People.” While this is a lofty title, it fails to capture the U.N.’s short-term challenges: convincing the Trump administration’s of its relevance. Since he announced his candidacy for the presidency, Donald Trump has questioned the significance of multilateral institutions and the rules that guide the global trading system. He has even been chastised U.S. relations with Japan, Canada, the United Kingdom and other European states. So it is not surprising that President Trump thinks that the U.S. needs to rethink its foreign policy priorities and it should only finance those international institutions that advance the nation’s interests. This explains why the Trump administration has decided to stop funding the United Nations Relief and Works Agency for Palestine Refugees in the Near East, better known as UNRWA, in late August 2018. The U.S. currently pays 22% of the U.N. Regular Budget, which finances the organization’s Secretariat and many of the U.N.’s policies. The current U.N. Regular Budget (2018-19), which is for two years, is $5.4 billion and the U.S. contributes around $1 billion during this time period. Even though the U.N. Secretary General had proposed to cut the current budget by $193 million, the U.S. forced the the U.N. to further reduce the budget by $93 million to achieve a 5% reduction of the amount budgeted for the U.N. in 2016-17. What do Americans think of the U.S. contributions to the U.N. Regular Budget? Do they want the U.S. to cut its funding or withhold it as a way to penalize the U.N. for thwarting U.S. interests? The Better World Campaign (BWC), a non-profit group that is trying to strengthen the bonds between the U.S. and the U.N., have been conducting public opinion surveys of American attitudes towards the U.N. since 2009. Its newest poll was conducted a year ago after President Trump delivered his first speech to the U.N. General Assembly. Polling from the BWC not only finds that Americans have favorable views of the U.N., but that these positive opinions have increased over time. According to latest figures, 65% of Americans have a positive opinion of the U.N., while 28% have a unfavorable view. Given the fact that so many Americans have a favorable attitude to the U.N., they should be critical of any effort to cut the U.N. Regular Budget or withhold payment of U.S.’s contribution as way to penalize the U.N. when it contradicts American foreign policy interests. Each member-nation of the UN pays a portion of the UN regular budget in the form of dues. These dues are based on a member-nation’s capacity to pay or its share of world income. The U.S. represents approximately 25% of the world’s income, and is assessed to pay 22% of the UN’s budget. Knowing this do you favor or oppose the U.S. paying our dues to the UN on time and in full? These findings suggests that most Americans would not support the Trump administration’s efforts to politicize the U.N. budgetary process. But, this is not actually the case. 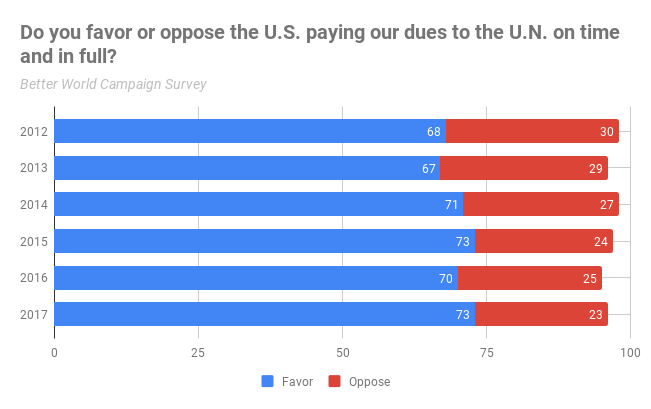 Given that President Trump is a very divisive figure, it is interesting that many of the people who strongly supported paying in full the U.S.’s dues to the U.N. Regular Budget also support his views. Indeed, 20% of respondents fully agreed with the statement and another 42% gave it ratings ranging from 80 to 100 points. Even though the surveys of the BWC find that most Americans have favorable views of the U.N. and many of its policies, other surveys demonstrate that Americans are a lot of more critical of the U.N. 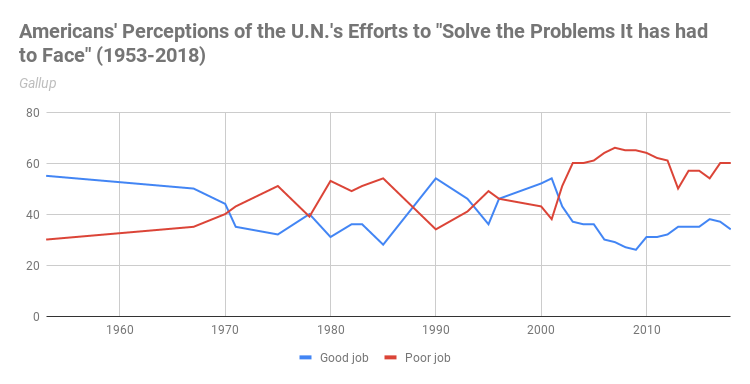 Since the 1950s, Gallup has been asking respondents the following question: “Do you think the United Nations is doing a good job a poor job in trying to solve the problems it has had to face.” As the next chart demonstrates, Americans’ opinions of the U.N. have shifted over time. Compared to BWC survey’s results, the Gallup’s findings show that many Americans give the U.N. poor marks. It is difficult to explain why Americans have these different views about the UN and why so many agree with President Trump’s statement. But, it is worth noting that Trump’s remarks stress that if the U.N. could deliver on its promises, “this investment would be easily worth it”. Trump’s views force respondents to question whether the U.N. is doing a “good” or a “poor” job – to use the Gallup survey’s characterization. 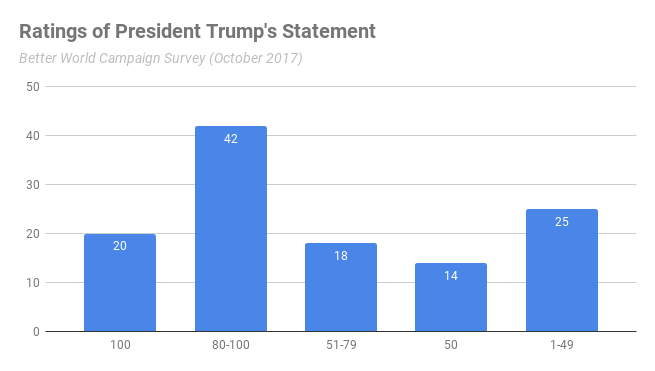 Thus, this could explain the disparity in the BWC survey between those that strongly want the U.S. government to pay its dues fully and on time versus those respondents who support Trump’s statement. Given that the BWC and Gallup surveys fail to give us a crosstabulation of their findings, it is difficult to see which Americans are most supportive or most critical. The Pew Research Center has conducted surveys on American’s public opinion of the U.N. for the last two decades. And one of their key findings is respondents’ party affiliation affects their views of the U.N. In 2016, 43% of Republicans had a favorable view of the U.N., while the same was true for 80% of Democrats and 64% of independents. In this post, we considered whether the U.S. public would support the Trump administration’s efforts to reduce its contribution to the U.N. Regular Budget or to withhold payment of its dues as a way to penalize policies carried by the U.N. While most Americans want the U.S. to pay in full and in time its budgetary contributions, many Americans also agree with President Trump’s view that the U.S. contribution is “unfair”. Given the Gallup poll’s findings, we should expect President Trump to continue his line of attack to make sure the U.N. and the Secretary General do not contradict U.S. interests. This brief analysis demonstrates that the U.N. leadership’s short-term challenge is not to convince “all people” of the U.N.’s current relevance. The Secretary General, Antonio Guterres, and his colleagues have to also persuade President Trump that America’s budgetary contributions will help the U.N. advance its interests. If the Trump administration decides to cut its funding or delay payment, the U.N. will have also curtail its activities, jeopardizing its 2030 Agenda. About the author: Carlos L. Yordán is a long-time observer of the United Nations. He is currently associate professor of political science and international relations & director of the Semester on the United Nations at Drew University.